Zombie flicks are my favorite horror film. Not only are they a subgenre of horror, they are a subgenre of post-apocalyptic fiction, which is a subgenre of sci-fi. That’s a lot of genre-ing going on. I like the post-apocalyptic stuff. Civilization on the brink or going down in a ring of fire. It’s fascinating. It gets the gears turning, but it’s not all that scary. That is, seeing society break down and enter a new dark age, no matter the cause (zombie horde, plague, nuclear war, etc. ), is unsettling, but when I think of something being frightening in film, I’m not just talking existentially. I’m thinking of actually being scared of looking at the screen. For that, there’s nothing better than the first half of a ghost film. For the first half of a ghost film, a viewer is locked into the creepiness and mystery of a haunted house just like the characters. The players don’t really know what’s happening or what to expect, and the director makes sure a viewer doesn’t, either. There’s generally a lot of tension, a lot of waiting for the scary stuff to happen, and that can be damned scary in itself. Let go and embrace a ghost story, and you can slip into suspension of disbelief without trying that hard. It doesn’t take a lot of flashy visuals. It doesn’t even take a sensible story. A dark room, a lonely cast member, that’s it. That’s the basic unit necessary to create uneasiness in a setting. Tweak it this way or that and there will be people closing their eyes in the theater because they are scared. And we all know it’s fake. Allow yourself to be carried along and a ghost film will scare the pants off you better than any other horror film. Why is that? Maybe it’s because out of all the creatures that make an appearance in horror, it’s only ghosts that have a connection to a person’s real experiences. Zombies, vampires, werewolves, giant bugs, aliens — these things we know to be the invention of modern storytellers. We never expect to meet them in real life. But all of us, every single one, has been alone in a dark house or apartment in the middle of the night, and not felt right. We’ve all had the chills, the heebie-jeebies. We’ve all heard a loud bang or seen something fall off a shelf for no reason. These, and many others, are unexplainable events. Not because they don’t have a rational, non-supernatural reason for happening. They do. Houses make noise, things fall off shelves. We accept that. But the second, the very moment, something like that happens, it’s a shock, and we don’t know what’s happening. It’s a flash of pure fear that sharpens the senses and gets the heart beating. Scale that up a bit, and we have ghost films. Grave Encounters, from last year, is a low budget ghost film written and directed by The Vicious Brothers (Colin Minihan and Stuart Ortiz). Shot in the found footage style, it presents itself as the lost recordings of a ghost hunting reality show. Lance Preston (Sean Rogerson) leads a team consisting of paranormal specialist Sasha Parker (Ashleigh Gryzko), technician Matt White (Juan Riedinger), cameraman T. C. Gibson (Merwin Mondesir), and fake psychic Houston Grey (Mackenzie Grey). Overnight, they lock themselves into an abandoned insane asylum outside of Baltimore hoping to get some footage for their show. They don’t believe in ghosts. They’re just there to catch some good video of darkened hallways and former patient rooms to assemble into an episode of their show. They didn’t expect to find any ghosts for real. Of course, they did. The characters may not believe in ghosts, and neither need the viewer. But this film doesn’t require a person’s rational belief. It just requires that out here in the audience, we believe bad things are about to happen. In that, Grave Encounters succeeds. Filmed on location at Riverview Hospital in Coquitlam, British Columbia (a very popular filming location for various Vancouver productions), the film never lacks for a disturbing setting. Abandoned places tend to be a little disturbing. They’re architectural corpses, so it’s easy to associate them with death and/or ghosts. Hinted at above, for about half the film, Grave Encounters kept me on edge. The accumulation of little things, little ghostly tricks scattered about here and there presaged the bad things about to happen to Lance and his crew. But like all ghost films, when the ghosts get serious and the big disturbances begin to happen, the film loses its frightening edge. The scary moments are telegraphed a bit too much to be shocking, and too many ghosts make personal appearances. The ghost you see is not as scary as the one you don’t. So, all that’s left the film is its tension. It manages to hang onto that quite well, leading to an ending that was heavily foreshadowed in the opening sequences, so it comes as no surprise. For some reason, a satanic altar makes an appearance, and that’s puzzling. Things had been going so well. The ghosts were owning the show. There was no need to bring the devil into things. The cast was perfect for this film. Normally when I see a film with a basement-level budget, I’m expecting wooden performances and maybe even some mumbling here and there. This was also one of those films that appears to have a fair amount of improvising by the cast, something that can ruin a film very quickly. But they handled it believably. Rogerson nailed the mannerisms of reality television hosts, especially with his bombastic, overly dramatic affectations while directly addressing the camera. Rogerson may have been the star, but I felt Mondesir as T. C. put in the most natural and effortless performance. His character could grate at times, but there was never a moment that felt like the guy was acting. He felt real, fully inhabiting his role to a further extent than other cast members. The look and feel of the film is taken directly from reality television series like Ghost Hunters or Paranormal State. 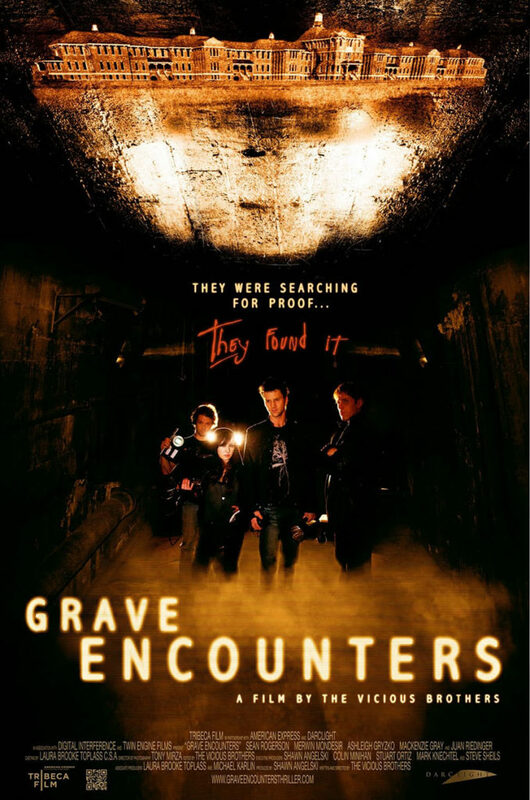 In that, Grave Encounters plays like the episode we would all like to see, where something actually happens. So it’s a sarcastically satisfying film in that way.